to the on-line edition and blog of Sophisticated Living St. Louis! If you want to see the print version of the magazine click here. It's time to pull out your fuzzy sweaters, don your coziest scarves, pile extra blankets on the bed...and enjoy cold-weather foods that just might warm your body! It doesn’t have to be hot chocolate, calorie-laden casseroles, and meaty stews loaded with salt and fat. "This time of year, it's natural to crave foods that are heavy in carbs, fat, salt, and, yes, sugar," says Chef Jennifer Bucko Lamplough, MBA, coauthor along with Lara Rondinelli-Hamilton, RD, CDE, of The Diabetes Cookbook: 300 Recipes for Healthy Living Powered by the Diabetes Food Hub. "Luckily, many of the dishes people love to eat when it's cold outside can be recreated into healthier versions of themselves," says Rondinelli-Hamilton. "You can get the flavor you crave without those ingredients that are bad for us all, but especially risky for people with diabetes." Get your fill of healthy and hearty soups. "Soups, stews, and chilis warm and fill you up without weighing you down, so they're great winter foods," says Bucko Lamplough. "Soup also makes a great last-minute meal because it comes together quickly, and can often be made from odds and ends you already have. 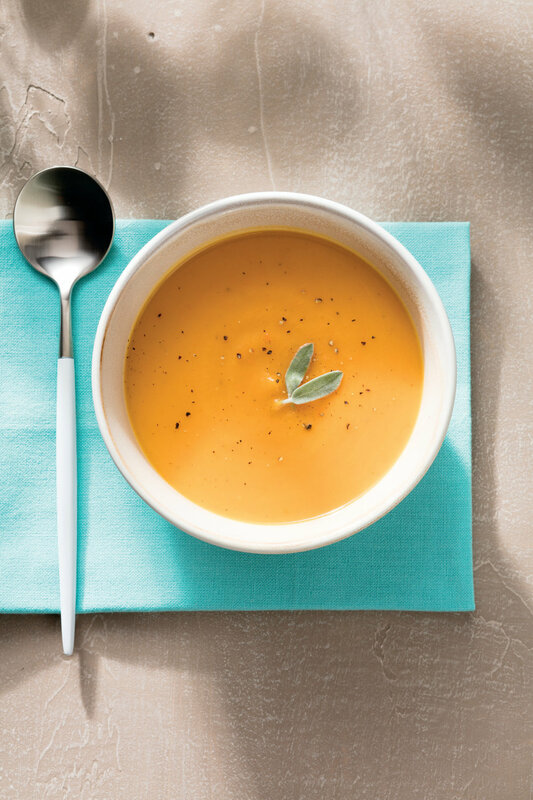 When you are extra hungry, try a hearty bean soup or chili, and if you're in the mood for a lighter meal, blend some roasted winter squash into a silky puree." Microwave the frozen squash for 5 minutes. In a large soup pot, heat the oil over medium-high heat. Add the onion and carrot and sauté 5 minutes, or until onion is clear. Add the garlic and sauté 30 seconds. Add the squash and sauté 3 minutes. Add the remaining ingredients. Bring to a boil, reduce heat, and simmer 15 minutes. After the soup has cooled slightly, transfer it to a blender and blend until smooth or use an immersion blender in the pot to blend until smooth. If desired, return the puréed soup to the pot to reheat before serving. Revel in the foods of the season. Hearty, filling, and warming vegetables like butternut squash, cabbage, kale, and beets are abundant this time of year, and there are countless ways to enjoy them. In place of your usual mixed greens salad, enjoy a kale salad sprinkled with lemon instead. Or roast a medley of root vegetables like beets, sweet potatoes, and parsnips in the oven to bring out their natural sweetness. Toss pomegranate seeds, red onions, and shredded carrots into your quinoa dishes for color and bursts of flavor. This 30-minute meal packs in lean protein from the turkey, lots of vegetables, and healthy carbs from the sweet potatoes. Place sweet potatoes in steam basket in a medium pot with 2 cups water. Bring to a boil, reduce heat, and simmer. Cover and steam until tender, about 15 minutes. While potatoes are cooking, spray a large sauté pan with cooking spray. Add onion and sauté over medium-high heat 3 minutes or until onion looks clear. Add garlic and sauté 30 seconds. Remove from pan and set aside. Add turkey and cook until brown, about 6-7 minutes. Add onion back to pan and stir to mix. Add diced tomatoes, mixed vegetables, mustard, Worcestershire sauce, and pepper. Bring to a simmer. In a small bowl, mix together cornstarch and water. Add to turkey mixture and stir. Let simmer 5 more minutes. Meanwhile, drain the sweet potatoes. Place sweet potatoes in a medium bowl and mash with a potato masher. Add margarine and whisk until smooth. Preheat broiler. Pour cooked turkey mixture evenly into an 11-by-14-inch pan or mediumcasserole dish. Spread sweet potatoes evenly on top of turkey mixture. Make It Gluten-Free: Confirm all ingredients are gluten-free and this dish can be gluten-free. This pudding is a treat during the holidays. Quinoa is a high-protein whole grain. Remember to rinse the quinoa before cooking. Rinse quinoa under cold water for 2 minutes. Whisk together milk, fat-free half-and-half, brown sugar blend, vanilla, cinnamon, and nutmeg in a medium saucepan over medium heat. Bring to a simmer. Once the milk mixture is simmering, stir in quinoa and reduce heat to a low simmer. Partially cover the pan and cook 40 minutes, stirring every 10 minutes. When quinoa is done cooking, stir in toasted pumpkin seeds and serve. Get updates from Sophisticated Living. Jun 19 Is Cryotherapy Right For You? Get updates from Sophisticated Living St. Louis.